If you really enjoy cooking and have a big family or you have many relatives and large family parties, you can sometimes feel like you’re preparing food all the time and the cost can sometimes feel prohibitive. Here are some practical time saving large family kitchen appliances and cooking tips to go with them that will help you to prepare reasonably healthy meals to feed a crowd and yet keep your food costs low. • If you serve meat as a side dish rather than a main dish. This is most easily accomplished by serving rice with a meat or fish dinner ie “bulking up” the meal. 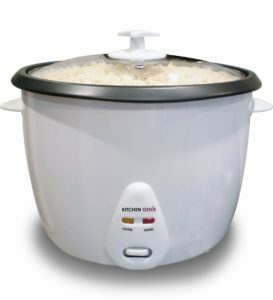 This can be achieved with a large capacity family size rice cooker which will take all of the guesswork out and with its keep warm function it allow your quests or the family to add as much as they want! 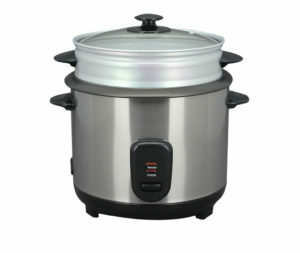 The Kitchen Genie 16 cup Large Family Rice Cooker :- Part of the Large Family Kitchen Appliances Range. • Try more smoothie recipes. These are great for kids to drink especially at parties and not only are they much cheaper than the branded sugary fizzy drinks you buy from supermarkets, they are much more healthy. You can even get vegetables into your kids diet with some tasty smoothie recipes. This can be accomplished with a heavy duty powerful blender which crushes ice to make those cool icy smoothies kids love. The Kitchen Genie 1500w Power Blender:- Part of the Large Family Kitchen Appliances Range. • Home made burgers made with an electric meat grinder taste much better than shop bought and more importantly you’re in control of the meat quality particularly its fat content. Buying burgers from supermarkets can be expensive and there’s no guarantee as to the quality of the meat. We all know that once its minced down you can’t really see to judge the meat quality, its fat content etc. A good powerful electric meat grinder with fine, medium and course screens will enable you to create all the mince you need for healthy quality burgers and much cheaper than shop bought. You can even pep them up by adding spices to the burger meat mix. 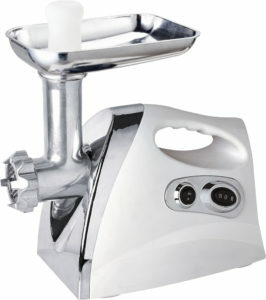 The Kitchen Genie Powerful 2000w Meat Grinder:- Part of the Large Family Kitchen Appliances Range.